Roger, you should really avoid having that waste lying dormant in the tanks during the weeks between trips, especially in the solid waste tank. If you’re only using the RV on the weekends and it remains less than 3/4 full, simply add more fresh water so that the total capacity of the black holding tank is at least that full prior to evacuating. Dump each tank after every weekend trip. Here’s the reasoning; in order to maximize the flushing velocity, it’s necessary to have the tank filled or almost full. A partially filled black tank can develop tank blockages if there is not enough force to flush out all the contents. This isn’t normally a concern for the gray tank. Just simply evacuate it normally after emptying the black tank. And be sure to run fresh water down through the toilet after draining the tanks to rinse the sewer hose, the valves and the connections. The polyethylene water tank and the water heater will not suffer any ill affects during storage periods of less than month if you choose to leave them full of water. But you be the judge; if the water smells odd or tastes stale, then you may have to drain and refill after each use. As you are probably aware, it all depends on the quality of the water you put in there to begin with, right? 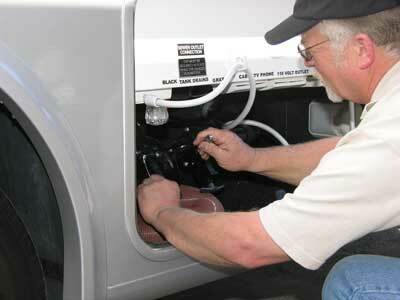 Many motorhome owners prefer to dump all the tanks, including the fresh water to avoid the added weight while driving. By the way, the December 2010 and January 2011 issues of Family Motor Coaching Magazine feature an in-depth, two-part article on Waste Management. Be sure to check them out! I go into great detail in all areas of waste containment, odor control and preventive maintenance, including information regarding new products and processes.